Display favorite vacation spots, memorable trips, hometowns, and places you've called home. Inspired by the iconic Key West signpost displaying locations and their distances, this version displays your own cherished ones: favorite vacation spots, memorable trips, hometowns, places you've called home, or anywhere else that deserves a milestone marker. Below the couple's names and (optional) home location, each distressed arrow—choose up to five—is painted in a bright color and decorated with your choice of icon from our selection. A pair of skis might represent a favorite slope, while palm trees may bring you back to that special sunny spot. 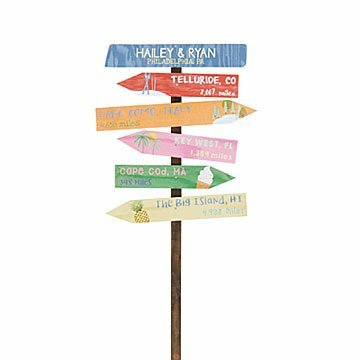 Whether they're destinations unknown (honeymoon in the Maldives) or heartwarmingly familiar (that first apartment together), this charming wooden sign will keep a couple's favorite places close to home. Made in Portland, Oregon. The lettering and icons are printed using a UV-protected ink, and the signs are finished with a coat of weatherproof paint. The natural fir we use features unique patterns in its grain, which come through on every piece. See the complete list of available icons. I put my signpost in the backyard garden where it can be seen from the pool area and the kitchen. It turned out just as expected and my family loves it! Great product, colorful, well made. Recipients loved the gift and thought it was very clever and creative. Backyard on water... very expensive. I'll keep it but next time, just make my own. Smaller than expected. Great and unique. Also easy to put together. Quite expensive for what it is but I couldn't find this in the UK and wanted it.